Due to the original work being a bit shorter than the book, two blank pages at the back have been padded out with additional holiday images by Jessie Willcox Smith. This archive includes corrected animation poses for the 20-page book (the original download had the animation poses saved out incorrectly). 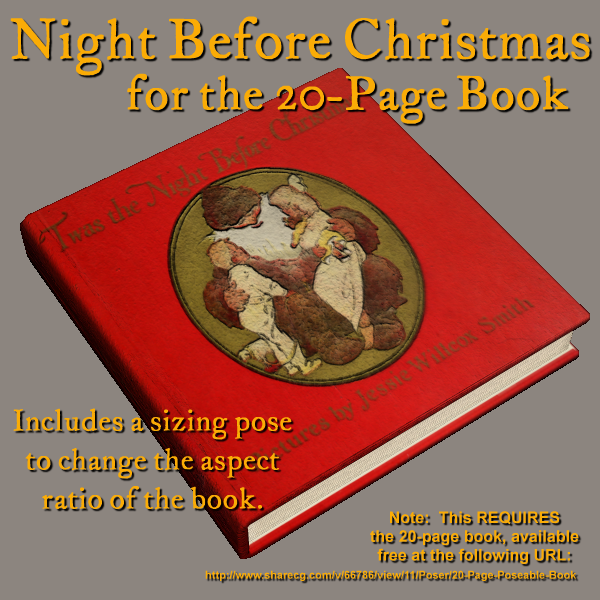 There is also an additional pose to set the correct aspect ratio for the original "Night Before Christmas" book - the original book was a children's picture-book, and was actually a bit wider than it was long. Another pose is included to restore the original aspect ratio. IMPORTANT NOTE #2: This item has been tested to work in Poser 9 and Poser Pro 2012. I do not know if it works in DAZ Studio, I don't have Studio. 1) You're free to use this model in any render, non-commericial or commercial. 2) You may not sell the model itself, either individually or as part of a compilation. 3) If you re-post this model on your website or as part of a free compilation, the archive must include this readme file. After you've arranged the files where you want them, open Poser. Load the book, then select it. Load the material pose, then load the pose to set the aspect ratio, and away you go. When you want to set the book to another set of materials, remember to use the "Aspect Ratio Normal" pose to restore the book to it's normal aspect ratio. SilentWinter (2 years ago) Inappropriate? thank you, nice addon for the book! i don't know the story (srsly, lol) but it gives a great children's book look. mazal (3 years ago) Inappropriate? novelist999 (3 years ago) Inappropriate? NIghtwind (5 years ago) Inappropriate? Brilliant. lovely work! So generous of you to share these. Ivy (6 years ago) Inappropriate? Jim Farris (Xaa) (6 years ago) Inappropriate? @Teri Perkins: Treasure Island is way too long to fit on twenty physical pages. A Mother Goose book, however, we can do. Should have something for you shortly. Nice choice. What about Mother Goose rhymes? Treasure Island? Well, I'm back and see you work miracles with time also. druc1 (6 years ago) Inappropriate? Thanks, once again, for a magnificent addition to my Poser runtime. I would love to see more textures for this absolutely wonderful book, but can't think of any that would be 40 printed pages (or less) and public domain, at this particular time. Want to see other books? Use the comment block here to make suggestions! Want to have your suggestions taken seriously? Keep your suggestions down to short works in the public domain that will actually fit on 20 physical pages (40 print pages), and remember to rate the original 20-page book!